This traditional German recipe for baked rice pudding with apples and raisins might be the best baked rice pudding out there! Old fashioned and super comforting on a cold rainy day! This traditional German recipe for Baked Rice Pudding is the ultimate comfort food! Are you ready for some sweet fall comfort food? Trust me, this baked rice pudding with apples and rum raisins will take your fall coziness game to the next level! I know what I am talking about because I basically grew up with this Old Fashioned Baked Rice Pudding recipe and just the smell of it takes me to a happy place. Seriously, a bite of this and I am back at my granny’s kitchen table in rural Bavaria. I can literally hear the cowbells ringing. Just joking. Not. But seriously, you will find this kind of baked rice pudding on German menus quite often. Kids simply love it and adults will order it for their kids knowing that they get to gobble up the leftovers (and discarded raisins). There are many slight variations, but this recipe is the best. Or shall I say “zeee bäst” (German accent, got it? ). It is a creamy rice pudding studded with raisins and grated apples with a nice cinnamon and butter flavor that just screams “granny loves me the mostest” . Obviously, there are many baked rice pudding recipes out there but believe me, this one is special! 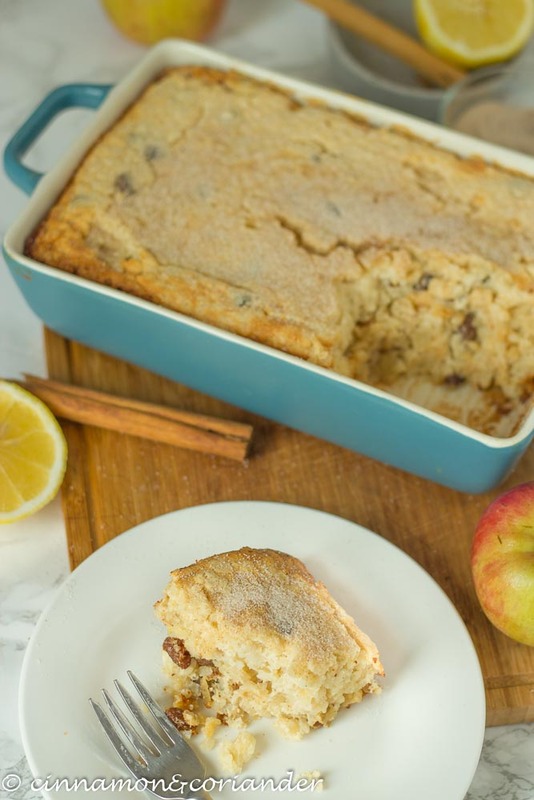 First off, it’s bursting with fall flavours – vanilla, apple, cinnamon – and BUTTER! Yes, this is more than a rice pudding baked instead of cooked on the stovetop. This is rice pudding extravaganza and clearly a “don’t count the calories” kinda dessert. We start out with a super creamy rice pudding, then fold under a creamy sugar-butter mixture that our stand mixer whips up for us in no time. We could stop here, but to make the baked rice pudding even fluffier, we also add some whipped egg whites to the “batter”. The rum raisins are totally optional for you but for me, they are a must add-in. I love the little fruity-boozy bursts paired with the creamy baked rice pudding. Don’t rush the cooking process. It’s going to take a good 8 minutes for the rice mixture to come up to a boil on medium-low heat. Cook your rice pudding on the stove top until al dente and the liquid surrounding the rice is thick and creamy. Use real vanilla beans for the most outrageously delicious vanilla flavour! I used two small apples for this recipe, so if your apples are big, one might be just enough. My gran used to make this baked rice pudding all year long with any fruit available in her garden. Cherries, raspberries, rhubarb, apricots and peaches work really well. If using canned fruit, please drain. If using frozen cherries, let them thaw and discard liquid. To make this a dairy-free baked rice pudding, substitute milk for coconut milk and use vegan butter instead of butter. The alcohol should evaporate during baking. Still, if you want to skip the rum, soak your raisins in orange juice. Don’t like raisins? Use cranberries or dried cherries instead. Preheat the oven to 160 Celsius (320 F)and line a casserole dish with some butter. Have all your ingredients ready. Add milk, rice, salt, vanilla, nutmeg and cinnamon to a pot on medium heat. If using a vanilla bean, scrape it out, and add the pulp as well as the pod to the pot. Bring to a simmer, reduce the heat and let cook on low for about 20 minutes or until the rice is just cooked and the pudding has a creamy thick consistency. As your rice pudding starts to thicken, stir in the soaking liquid from the raisins. This is the consistency we are looking for! The rice shoult be al dente and the pudding thick and creamy. Take rice off heat and transfer onto a shallow plate to allow for quick cooling. You can also put it into the fridge to chill. Zest the lemon right into the sugar and rub it into the sugar with your fingertips. Separate the eggs and add yolks to the bowl of your stand mixer along with the lemon sugar and softened butter. Whisk until light and fluffy for about 7 minutes. Peel and core the apples and grate them coarsely. Drizzle with lemon juice to prevent browning. Fold rum raisins, then whisked butter mixture into cooled rice pudding. Start whisking the egg whites with a pinch of salt until stiff. This is the consistency we want! Fold egg whites into the rice pudding mix carefully and just until combined. and top with grated apples, then the rest of the rice mixture. Bake for 50 minutes, covering the casserole with aluminum foil towards the end. Which rice is best for making baked rice pudding? Here’s the thing. In Germany, we use exclusively round short grain rice for sweet dessert-like recipes. If you want the full-on German Granny old-fashioned baked rice pudding experience, go with short grain rice, like Japanese sushi rice or arborio. Basmati rice and jasmine rice are a bit too flavorful for this particular recipe, which should be a celebration of fall-flavours like cinnamon, vanilla and apples. How long does this baked rice pudding keep and how do I store it? I like to store my leftover baked rice pudding in an airtight container with a tight-fitting lid. When chilled in the fridge, it keeps for about a week. It tasted delicious straight out of the fridge but I like to reheat it in a 300 F (150C) hot oven for about 8 minutes. For more traditional German recipes, check out my Rustic German Apple Cake or my Granny’s Red Wine Chocolate Cake or maybe an old-fashioned German Fruit Cake? ★ Did you make and love this baked rice pudding recipe? Give it your review below! And make sure to share your creations by tagging me on Instagram! Preheat the oven to 160 Celsius (320 F)and line a casserole dish with some butter. Add milk, rice, salt, vanilla, nutmeg and cinnamon to a pot on medium heat. If using a vanilla bean, scrape it out, and add the pulp as well as the pod to the pot. Bring to a simmer, reduce the heat and let cook on low for about 20 minutes or until the rice is just cooked and the pudding has a creamy thick consistency. Stir in the soaking liquid from the rum raisins and stir. Take rice off heat and transfer onto a shallow plate to allow for quick cooling. You can also put it into the fridge to chill. Zest the lemon right into the sugar and rub it into the sugar with your fingertips. Separate the eggs and add yolks to the bowl of your stand mixer along with the lemon sugar and softened butter. Whisk until light and fluffy for about 7 minutes. Fold rum raisins, then whisked butter mixture into cooled rice pudding. Start whisking the egg whites with a pinch of salt until stiff. Pour half of this mix into your casserole and top with grated apples, then the rest of the rice mixture. Bake for 50 minutes, covering the casserole with aluminum foil towards the end. Let cool slightly and serve sprinkled with cinnamon sugar. This sounds like a very interesting recipe. Soaking the raisins in rum…YES!! This looks like it has a crunchy top?? I have never had rice pudding with a crunch top before. Such a perfect dessert for entertaining! Love how simple it is!! My grandmother who was German, used to make something very similar but alas, her handwritten recipe book went missing after she died. I’m so glad I found your delightful recipe and I can’t wait to try it to see if it tastes similar to what I remember! The texture of this rice pudding looks so interesting! I’ve had baked bread pudding that looks like this before but not rice pudding. What a fun recipe – my family would most definitely enjoy having this after dinner. Yum! I haven’t had rice pudding in a long time! After seeing your recipe, that’s going to change. Reading through this post really makes me want to go to Germany and try this! Along with all the other cuisine there. Love your use of spices in this recipe. Thanks so much for the inspiration! I’ve never seen rice pudding done this way, but it looks absolutely scrumptious! I love the cinnamon and nutmeg added to this to make it taste even better! Such a delicious recipe for rice pudding. I love the addition of lemon zest, adds a great layer of flavor. This is a great dessert to feed a crowd too! Never had rice pudding before excited to try this! I LOVE rice pudding and the sound of it baked and with all the butter is literally cozy perfection!!!! I’ve never had rice pudding before. This looks so yummy and your step-by-step instructions and pictures are so super helpful!! I’m definately going to give this a go! What a wonderful recipe! My husband has been begging me to make this for him, and now it looks like I have a good recipe! Thanks! What a interesting recipe. I love rice pudding but never tried anything like this. I absolutely love the flavors and how easy this is to make. I’m saving this recipe to try, for sure.